Gr. Chelidonton (fr. 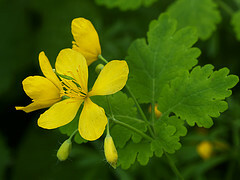 chelidòn), L. Chelidonium majus, Fr. schelikraut, MEng sellandine, Eng celandine, This is an herb of the Papaveraceas or poppy family having yellow flowers and blooming from late winter or early spring through the summer, if there is sufficient humidity. It is a native of Europe and S. Asia found in rocky, shady and temperate regions in the southern part of the Iberian Peninsula. In England, it was cultivated in hedges. It emits a disagreeable odor and produces a hot, stinging sensation and bitter taste. In ancient times, the plant appeared in late winter or early spring and disappeared at the end of summer with the migration of swallows. It was thought, therefore, that they brought it because after hatching their young and they began to see the mothers pecked at their eyes making them blind again. Then the babies were given celandine and recovered their eyesight quickly due to the magic yellow or orange juice contained in the flower. Actually the nestlings recuperated their sight naturally but that was not discovered before it became the general belief that celandine helped eyesight following Pliny’s recommendation. The juice from the plant has been used to remove film from the cornea. As Andalusians followed Nabatean agriculture as a model, celandine was cultivated particularly in Seville i between the 11th and 13th centuries and used for its aroma with parsley, oregano, eight varieties of celery and rue. They were synonymous with luxury and exoticness. These herbs were systematically included in dishes with mastic. They were chewed to prevent bad breath and to cure epilepsy. A 14th C celandine drink was thought good for the blood. The leaves and flowers were mixed with oil to make a plaster, which was applied to human eyes for this. Since, applications of this mixture have been found to increase the healing process of ulcers and sores and to diminish warts and freckles. The English, also, used it to help sore teeth. Discorides recommended drinking the liquid or latex from the root, boiled in water for liver ailments and to excrete humors in the urine. The oil from the seed was drunk with hydro-honey to purge the stomach. Discorides did admit that the liquid can be deadly poisonous as it produces narcotic effects like opium. Today, it is recommended for external use only unless administered under a doctor’s prescription. The latex contains alkaloids chelidonine, chelereythrine and protopine. For internal uses, it is dried and used as a sedative, purgative, expectorant and diuretic. Specifically some of the ailments for which it is used are hepatitis, jaundice, gallstones, indigestion, nausea and vomiting. Further, patients who have depressive or lethargic tendencies are treated with it.